Earlier I designed subwoofers to go down to 20Hz and it seemed to be very important. Later I realized that music and movies have very minimal information below 30Hz and it's much more important to have good quality bass on 30-60Hz range and good integration to main speakers. I have always preferred closed subwoofers enclosures with electrical correction, because of smaller groud delay and better phase response. With proper driver (low Q) the bass reflex enclosures will give quite nice sound. Also it's important that subwoofer can produce sound loud enough without no compression or distortion. This is very important with current DVD movies since they have such large dynamics. If you adjust the volume in order to have natural sound level for dialog, then the effects (explosions etc.) are very very loud. My current subwoofer system is far from optimal, but produces quite nice bass for movies. Picture of my old subwoofer. The subwoofer amplifier has fixed 6dB "boost" in 30Hz (quite wide effect, about one octave). The closed enclosure with "high" roll-off frequency fit's quite nicely to the fixed boost of the amplifier module and bass extends down to 30Hz. In future I will move from apartment to own house and naturally then listening levels will be higher. Also room size will get bigger and therefore more sound pressure is needed. Old subwoofer is ugly. See picture above. First I did simulate with some car audio subwoofers, like Peerless R.15. 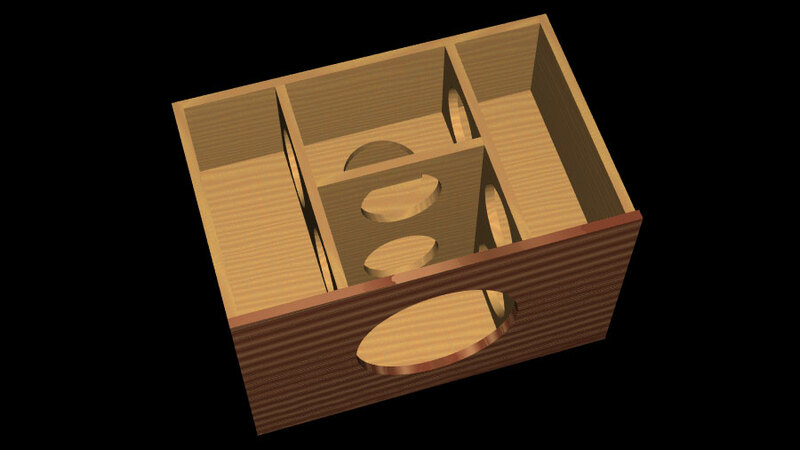 Most of the car audio subwoofers had too high Fs for closed box. But soon found out that there aren't many suitable subwoofers. Then the project didn't move on for some monts, but then my friend found out that Adire Audio drivers could be purchase from Europe also. I did check parameters of Adire Audio drivers and found out two very interesting models: Tempest and Maelstrom. 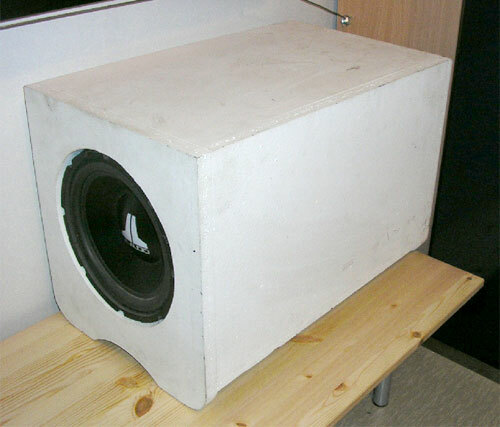 Maelstrom would be nice subwoofer if you could fit 300 liter enclosure, I can not fit that big enclosure to my current living room. Also Maelstrom is quite expensive (compared to Tempest). I usually prefer closed subwoofers with Qtot near 0.6, well damped and controlled sound. 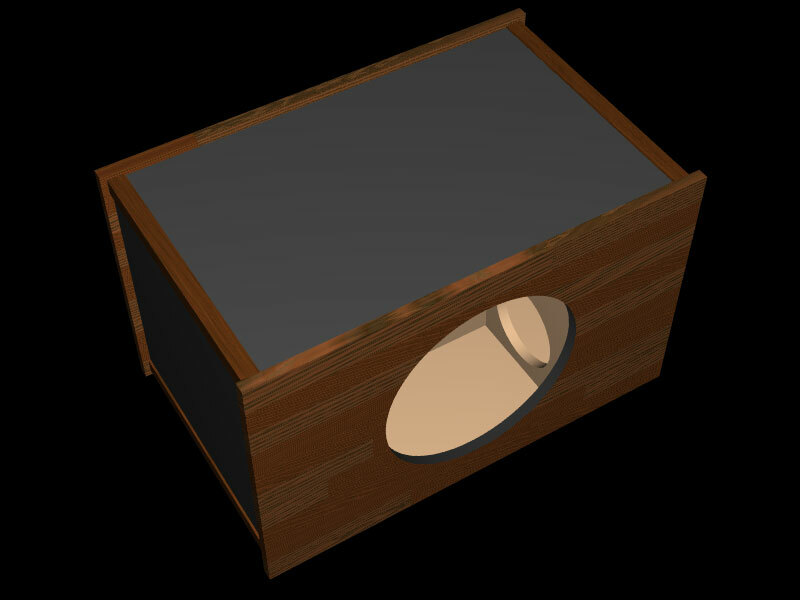 But because of my changed listening habits (now 90% movies, before 90% music) and the fact that I don't have too much room for the enclosure, I decided to build Qtot 0.71 (butterworth alignment) subwoofer. With Adire Audio Tempest that is about 125 liters, which is quite big box (I'm used to 10" subwoofers). Tempest and BA-150 simulated frequency response. 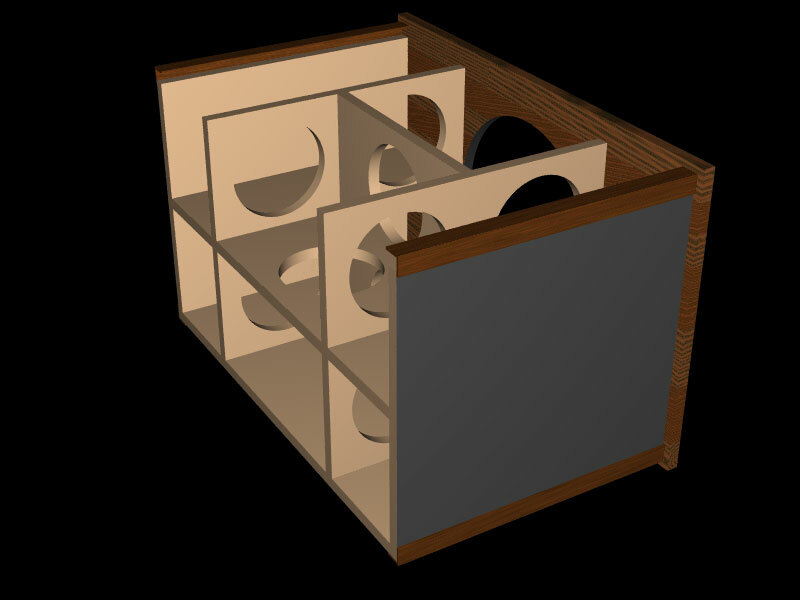 The drivers response is calculated by formulas in The Subwoofer DIY Page and Simex BA-150 frequency response is calculated by formulas in Janne Ahonen's homepage. As can be seen from the graph, now the bass extends lower because the peak of subsonic filter is much lower. If the increased peak (=increased Q value) will decrease the transients too much then I have "plan B", which is to change the resistor R26 from 18000ohm to 82000ohm. This will move the subsonic filter to 10Hz and decrease the Q value of filter to 0.9. Testing is required to find out if the large Q values ruins the sound. This would also decrease the bass level below 30Hz. These simulations doesn't take into account the Dolby Digital amplifier's crossover. I have Harman/Kardon AVR-2550, which has fixed 100Hz lowpass filter for speakers with "small"-setting. Also room gain is not taken into account in these simulations. As can be seen from frequency response simulations the -3dB points are at 20Hz and 200Hz (without H/K 100Hz lowpass) and therefore subwoofer is very suitable for LFE use. Usually the frequency response of subwoofer's low end is improved by decreasing the lowpass filter's frequency. This can be done with 2 channel system for music listening, but not in Digital Surround system since subwoofer has to produce the whole range of LFE channel. This will be major improvement compared to old subwoofer system, in which I had to lower the lowpass frequency in order to increase the level of very low bass (<30Hz). 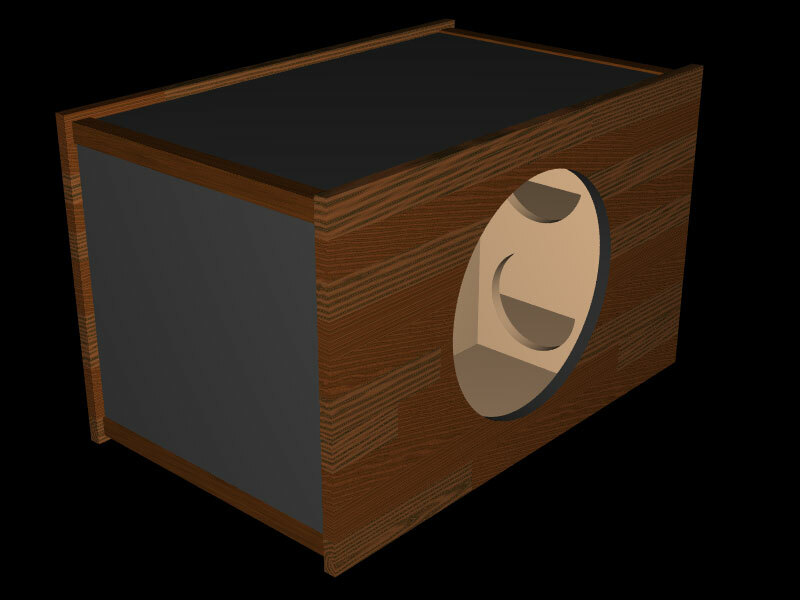 After acoustical design I could start the mechanical design of the subwoofer. 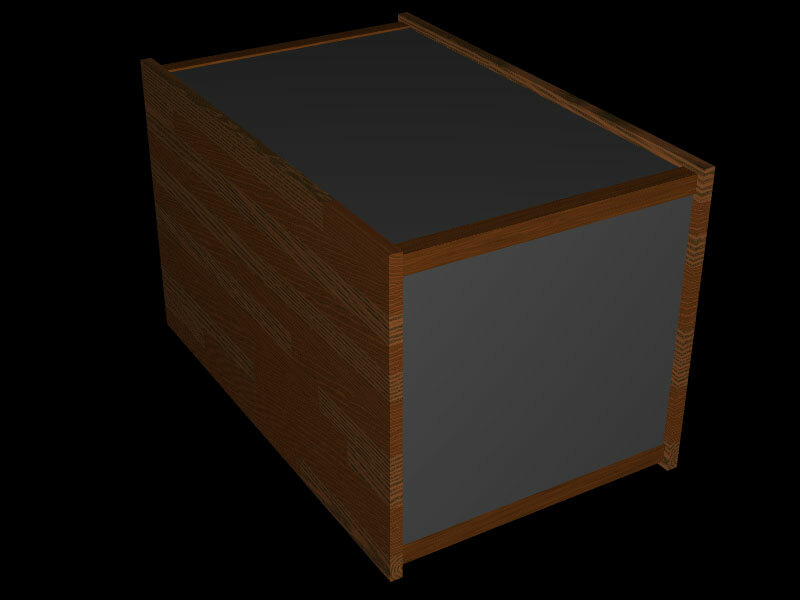 I had vision in my mind of enclosure, which front panel (and maybe back panel) is(/are) made of real wood. And the rest of enclosure is made of MDF, which is painted to black. Inside enclosure there is "matrix" of MDF to minimize the "panel span" (free board without braces). Here are my initial drawings (made with PovRay): top and back. 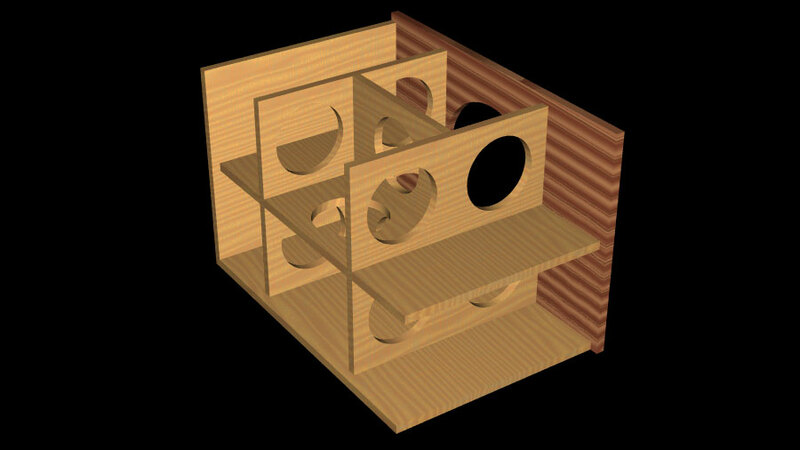 2005-01-03 The front and back of the subwoofer will be made of Acajou wood. 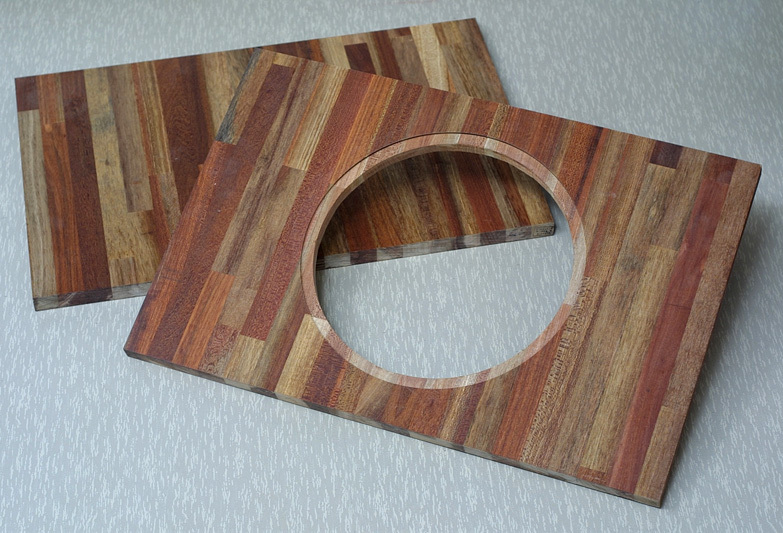 See picture of the wood.